Welcome to Sydney Trains Vlogs... Blogs. On this Blog you will find updates about trains and stations across Australia. You will also find lots of stories about Australian Railways. Hi all and welcome to another STV Blog. When i upload videos of Transperth B Series sets on the back of freight trains on transfer through Sydney a few of you ask why there is a B Series set in Sydney. Well i thought id explain it. Well ill do my best anyway. For those who don't know what a Transperth B Series train is. They are the newest passenger trains that operate in Perth on the Transperth Train Network. 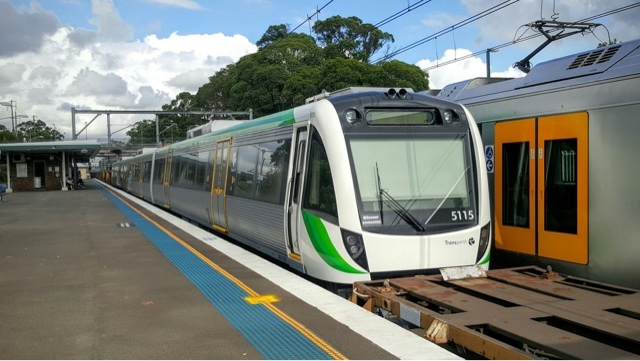 Here's a photo of Transperth B Series set 115 being transferred through Thornleigh just north of Sydney with one of Sydnes new trains 'Waratah' next to it. The B Series trains are built by Downer EDi in Maryborough in QLD. The B series is transferred from the EDi plant in Maryborough to Acacia Ridge in South East QLD where it's put on standard gauge transfer bogies and attached to a freight train from Acacia Ridge to Morandoo Yard in NSW near Newcastle. From Morandoo it's put on the back of a steel train and transferred to Port Augusta in South Australia via the Central Coast, Sydney & Goulburn etc. Im sure it's put onto another train for the remainder of the journey from Port Augusta to Perth.